Enjoy wine tasting and a run! This is a very pretty, nearly 10k loop around the perimeter of Lake Hayes — nicknamed ‘Mirror Lake’ and one of the most photographed lakes in New Zealand. The trail, called the “Lake Hayes Circuit”, features great water and mountain views along this lake, a boardwalk protecting local wildlife, historic cottages, and some spectacular homes. 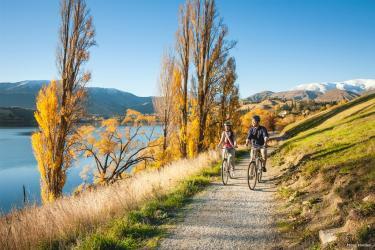 The lake is located 5 km east of Queenstown, between Queenstown and Arrowtown. Start just below the parking lot of the charming Amisfield Winery, and enjoy plenty of ‘Instagrammable’ photo opportunities around Lake Hayes, appreciating the fresh mountain air, reflections of the mountains in the water, and the pretty flora and fauna.